Produktinformationen "BNC adapter for myDAQ [FRI 2000-2]"
The FRI 2000-2 is a breakout board for the National Instruments myDAQ. 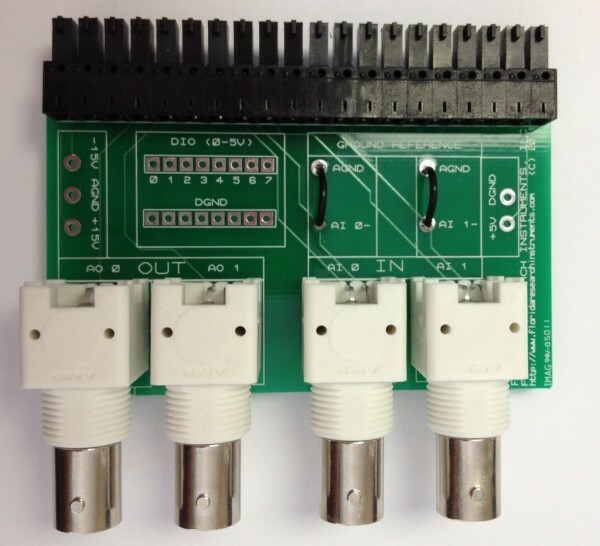 It has convenient BNC connectors for the analog inputs/outputs, and access points for the power and digital IO. Optional accessories include BNC cables, screw terminals for the +/-15V and 5V power supplies, headers for the digital IO, and pins for digital IO. Note: This board cannot be used with x10 oscilloscope probes. Please see the FRI-2100-1 if you would like to use the myDAQ interface for a software-controlled oscilloscope. Weiterführende Links zu "BNC adapter for myDAQ [FRI 2000-2]"
Kundenbewertungen für "BNC adapter for myDAQ [FRI 2000-2]"